Felted Wool Animal Mobile – ElephantsFelted Wool Animal Mobile &ndash; Elephants, alt="Felted Wool Animal Mobile &ndash; Elephants, "
Print A favorite safari animal meets a beautifully hand-crafted piece. 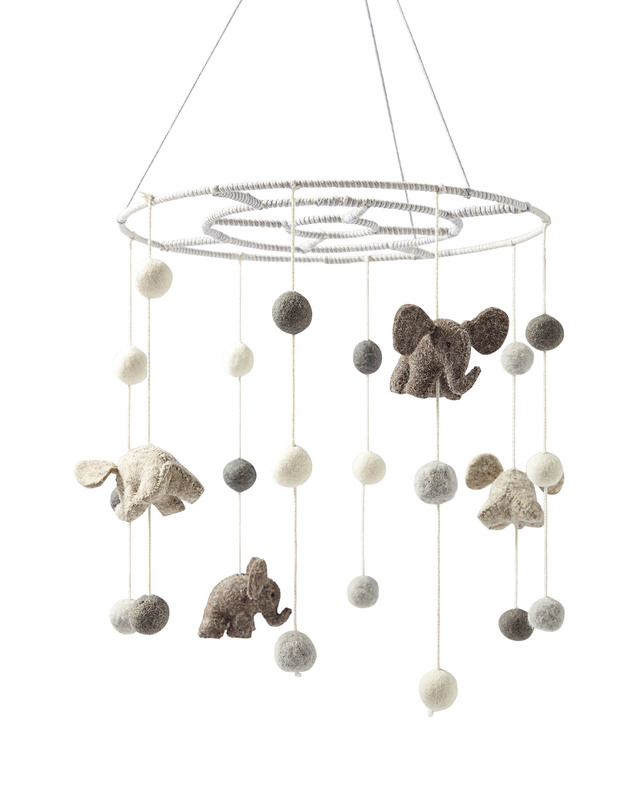 Each little elephant and felted wool ball is made from organic lambswool for a soft look and feel. The rings are carefully wrapped in cotton yarn for a soft finish that completes the handmade look. It's the sweetest way to soothe them to sleep. Elephants and poms are made of 100% felted, organic lambswool with a 100% polyfill fiber fill. 100% cotton yarn covers the powder-coated, galvanised iron frame. Features a hanging ring; hanging hardware not included.